On Friday, I received a handwritten thank you note from the executive director of a nonprofit I have volunteered with for almost three years. I don’t know about you, but receiving handwritten notes is so rare now, it tickles me whenever I see one in the mailbox. The note couldn’t have come at a better time because, in the past few months, I have been reevaluating how I spend my time and where I spend my time…particularly where I invest my volunteer energy. My proverbial plate is full, and I need to make some hard choices, sometimes picking between two things I care about. I have to ask myself difficult questions about why I’m investing time in a particular organization, how its values match mine (or not), and what my long-term goals are. If you get into volunteer work hoping for accolades and appreciation, you are going to be disappointed. Most of the time, the demands are high and the thanks are … well, low. You have to get your satisfaction from other things—you know, helping people, making a difference, blah blah blah…just generally becoming a less selfish person. When you are close to burnout, being a selfish person can sound like a very tantalizing idea. Lately, I have felt disengaged from a couple of causes that I care very much about, and it has been disorienting at best, and at worst, demoralizing. In some cases, I still care about the cause but feel a lack of connection with the people or goals at the organization. In other cases, I feel deeply connected to the people and goals, but I’m not sure my contribution is really making a difference. In this case, I get deep fulfillment from the mission and work, but it requires significant time and emotional commitment. I just don’t feel I am getting the community support that I need or like I matter to the organization. I had to admit I was losing a sense of connection. My fourth and last case finished up in April, and I haven’t taken a new one. So when I first saw the thank you note in the mailbox, the cynical side of me thought, oh they finally noticed. I also felt a sense of relief. They Finally Noticed. I miss the handwritten thank you note. I miss “thank you” in general. I don’t think we hear it often enough, but even when we do, it’s usually a text, a quick email, or said in haste as we run off to our next obligation. And I am just as guilty as the next person. But in the last month, thanks to Gretchen Rubin, I have adopted a new mantra for the summer: Don’t let the perfect be the enemy of the good. I think quite often, I have big ideas about thank you gifts and long letters, and if I don’t have the time or resources to do the Big Thing, I end up not doing anything at all. I have boxes of cards I bought but never sent. I have gifts still sitting in shopping bags that never made it to their intended recipient. I have a lot of guilt about the whole gift-giving process. 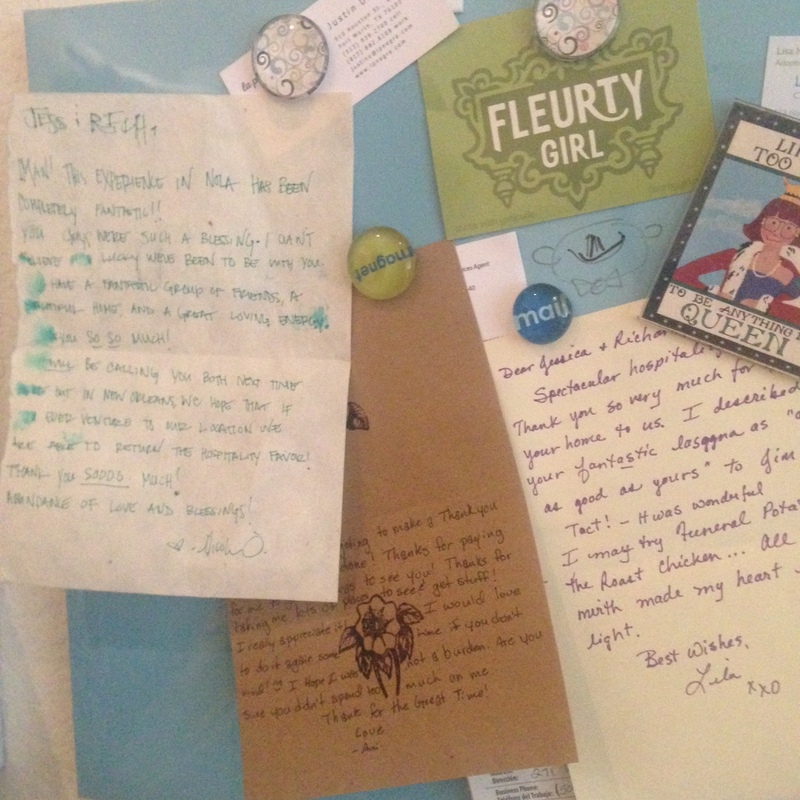 I also have a bulletin board in my office with several thank you notes pinned to it. When I started thinking about this post, I reread a few and noticed a common theme. Most of them aren’t grand gestures and they weren’t written in response to something big that I did for them either. They are just quick but sincere notes of appreciation that someone took the time to jot on a card, put in an envelope with a stamp and drop in a mailbox. They don’t cost a lot of money or a lot of time. But they matter to me. And they remind me that those little efforts to appreciate people are worthwhile … and within reach. I believe the best parts of our lives are built on little kindnesses and small gestures, and I don’t want to keep my gratitude for them to myself. This week I am blowing the dust off my box of thank you cards and finding a working ballpoint pen. You have been warned. And your good deed may go … noticed. I would like to say I too had “lost” the art, but to be honest, I’m not sure I ever “found” it in the first place. Oh the guilt! 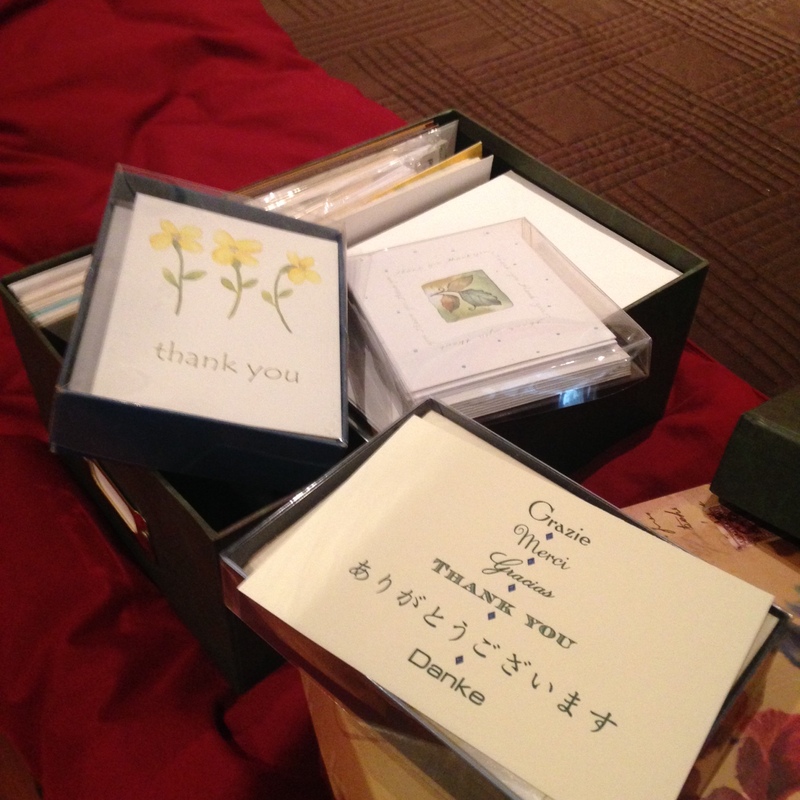 I have a box of greeting cards and thank you notes too. I use the feeble excuse of not having an up to date address book.